At the end of last year, iVEDiX UI/UX Designer, Ryan Bell shared with us 7 Principles for Designing with Purpose. Today, we’re revisiting that topic, while sharing in the upcoming celebration of love (ie. Valentine’s Day). 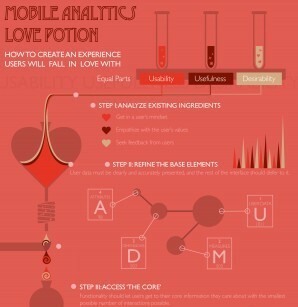 At iVEDiX, we believe that the principles Ryan shared are the ingredients for formulating a mobile analytics “love potion”. iVEDiX Announces New Compatibility with BlackBerry Enterprise Services Is 2015 the year HTML5 reigns supreme?